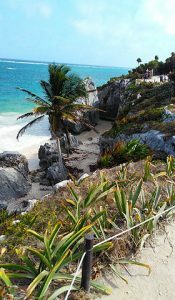 From Playa Carmen, I took the ADO to Tulum and checked into an small apartment-like hotel along the highway. Pleasant people work there and it’s impressively clean. I dropped-off my luggage and took a cab to see the local ruins and wow, what a beautiful place! The ruins by the cliffs are breath-taking to say the least. I sat by the sea cooling off in the breeze and looking down at waves crashing below. It felt like a dream! It did not take too long for the whistle-blowers to show-up, however, and everyone had to go. During my visit, I noted some of the buildings had a circular shape, especially at the base. One of the plaques read, “Mesoamerica is a geographical area with common features and cultural elements, comprising Central and Southern America and Central America. Among many similarities in this area there was a cult of the wind god, although he was known by names in the language spoken by each group. 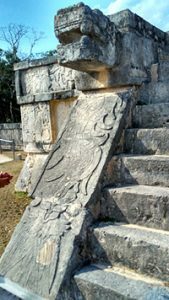 In Maya he was called Kulkulkan (associated with the feathered serpent)… Experts have identified that a feature of the temples built to the wind god was a circular shape – when seen from above. This is the case in Mayan architecture”. As mentioned previously, I had spotted rounded construction at the base of the main pyramid in El Rey. The Feathered Serpent seems to rule the Coastal area. Afterwards, I went out for dinner. The hotel room came with a free bike rental and I regretted not using it for the trip into town because my feet were soon killing me. Tulum is expensive but I found an affordable submarine sandwich at a gas station. The service was extra polite and the “Subway chain” is always fine, despite the dry bread. The next day I stopped in Play Del Carmen for lunch. The ADO will look after your luggage for a small fee, so you won’t have to drag it everywhere. A charming Senorita was also waiting in line and asked me where I was from. It’s amazing how a woman’s smile can make your day. After eating, I went to look for “Charlie the Mayan” before heading back to Cancun, hoping he could tell me something relevant to my quest. But for some reason, I couldn’t remember where his store was located! The midday sun was beating down and the touts were relentlessly approaching so I gave up and returned to the ADO. Waiting for the bus, I (musingly and jokingly) imagined “Charlie the Mayan” as being more than what he seemed. I wondered if I missed my chance to interview the Feathered Serpent! In this land of paradoxes and contradictions, Kukulkan might just disguise himself as a souvenir salesman. At least I avoided wasting money on things I don’t need. If budget travelers are going to spend money on souvenirs, I will always recommend conserving cash and buying less. Emergencies do happen. You never know when you might need the last few pesos. 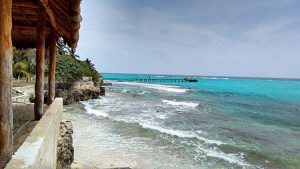 I arrived back in Cancun and the next morning was spent on the other side of town in Puerto Juarez. I took a taxi to El Meco and had the entire place to myself! Apparently, this is the norm – no crowds and no whistle-blowers here but there was a stern-looking groundskeeper walking around with a machete. The ruins of El Meco are shady and cool. 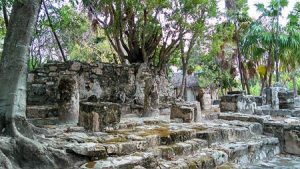 Not far from the shore, El Meco features tree-shaded atmospheric ruins with jungle roots and vines growing over top (An excellent set for the next Indiana Jones film). The small pyramid is impressive at the front but looks like crazy patch-work at the back. I can remember feeling indignation at seeing the Kukulkan snake-head figure had been vandalized and chipped apart. But I noted coil and curl motifs as part of the original statue and wondered if they might represent snakes or waves of the sea. The cabbie returned after an hour and drove me to the Ultramar Ferry for the short trip to Isla Mujeres (Isle of Women). 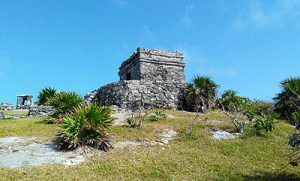 This island is the most Easterly place in Mexico and maybe the first site or landfall for ancient mariners traveling in Pre-Columbian times. There is a small ruin here, I would love to get a grant and permission to excavate. The Ultramar transporter is fast but sit at the back as the boat gets rocked by waves. 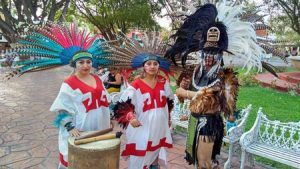 Upon arrival, you will find yourself in a Playa Del Carmen-like downtown area without the pushy salespeople. I like it better. There are plenty of shops, bars and cafes to kill time if you are waiting for the ferry. Remember to haggle with the shop-keepers. Always remember to negotiate a lesser rate with the driver before you get into the cab. A lot of taxi drivers will try to maximize your fare. Such a driver took me across the Island to the “Garrafon de Castilla” where you can snorkel off the beach. They rent snorkeling gear but I recommend bringing your own kit as much of their stuff is for kids. You will see some rocks and many colorful fish. There is a small park entrance fee, approximately $5 USD. People were friendly. I chatted with some other foreigners here, including a couple of Scandinavians who knew English. They were good people. While waiting for the return Ferry, I walked around the town area. It was like Playa Carmen but much more Mexican in character. No touts attempted to hassle me and there were plenty of places to sit and have a beer, coffee or ice cream. The store-owners and cafe workers seem polite yet reserved and this was very much appreciated. Overall, it was a productive trip but way too short. Still, I managed to experience multiple vibes and see some amazing places. The mysterious cenotes and underground rivers of the Yucatan have a spiritual side and I can see how the Mayans felt water was a conduit or pathway to the gods.